Mia Allen — "Best Actress" Award! I was nominated for "Best Actress" for a short comedy I was in called "No, Oui", written and directed by the one and only Greg James. Greg and I met last year on set of the indie feature, "Zilla and Zoe". The combination of his endless immaturity and my habitual tendency to be everyone's mother, we became instant buds, and strong advocates for each other's careers. I was thrilled to be cast in a short film that he wrote, directed, and starred in along side me. I've learned to do my best not to become emotionally invested in these types of things, as "Winning" is not something that's ever actually happened for me before. I wore my grandmother's earrings to the event, just to remind myself that it didn't matter either way... There are people that love and support my efforts, without substantiating accolades. All that being said, it was an honor to receive recognition for my work! Thank you to all of my friends and mentors that have been cheerleaders for me as I relentlessly pour myself into any opportunity that comes my way. You inspire me! Check out the film and the production stills from "No, Oui" here! 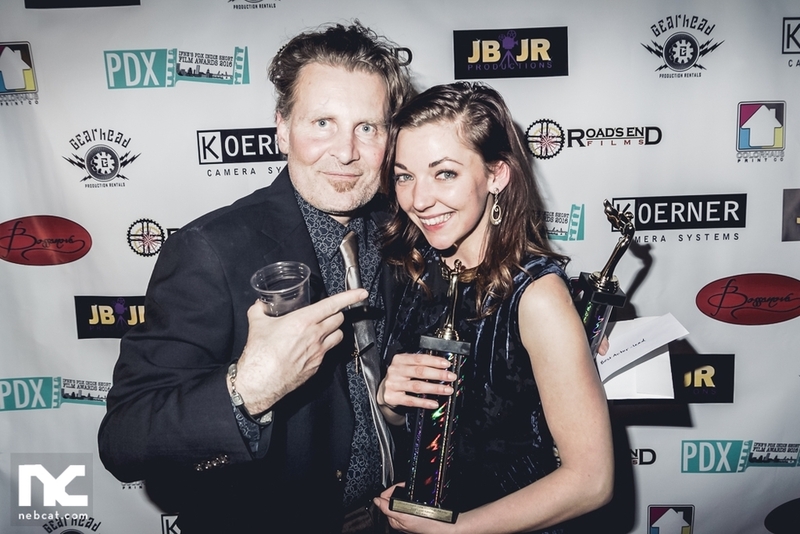 Best Actor, Todd Robinson for "Stray" and me for "No, Oui"
Julie Elizabeth Knell played my mom in Zilla and Zoe, and sometimes does in real life too.